The history of the military rank of “Admiral of the Fleet” and “Admiral of the Soviet Union Fleet” is rather complicated and intricate. Suffice it to say that these two ranks, in different historical periods, were thought to belong to different land forces ranks; and it was not until 1962 that they were combined into one (heretofore, there was only one naval rank higher than “Admiral” which was equal to Colonel-General). With the establishment of the General and Admiral ranks in 1940, the rank of “Admiral of the Fleet”, which was equal to the land forces rank of “General of the Army”, was introduced, but, unlike the latter one, it was conferred to no one. Up until May 1944, when N.G. Kuznetsov, People’s Commissar of the Navy, and I.S. Isakov, Commander of the Navy Headquarters, were given the rank of Admiral of the Fleet, the highest Navy rank had, practically, been the rank of “Admiral” (1). “In 1944 at the General Headquarters, Stalin, to my surprise, brought up a question of my conferring a higher rank. At that time, we did not have any rank higher than the rank of Admiral and, consequently, no corresponding shoulder straps were designed. I reported that other fleets had a rank of Admiral of the Fleet. 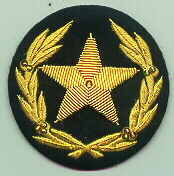 Then Stalin asked: “What will be its equivalent in our Armed Forces?” I answered that following the order established in the Army, Admiral of the Fleet should be given the four-star shoulder straps; but in this case it would not correspond to the highest rank among the land forces commanders, i.e., the rank of Marshal. Then it was decided to establish the rank of Admiral of the Fleet with four stars on the shoulder straps without specifying its equivalent in the land forces. So, I was given another rank of Admiral of the Fleet with very unusual shoulder straps which were not typical for the Fleet at all. To tell the truth, I did not wear them long. In May 1944, it was decided to replace these shoulder straps with one-big-star Marshal ones. When the question of compliance with the Army Regulations was discussed, and when the need of specifying the rights and obligations of the Admiral of the Fleet in the Table of Ranks arose, it was written in black and white that the “Admiral of the Soviet Union Fleet” was equal to “Marshal of the Soviet Union”. 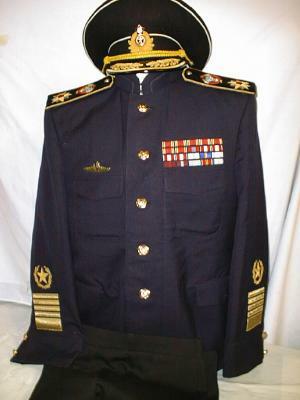 So the chronology of the historical events, described by Kuznetsov, looks as follows: the rank of “Admiral of the Fleet” and four-star shoulder straps were given to Kuznetsov and Isakov on 31 May, 1944 (this rank, as we had already seen, existed in the Navy for 4 years although it was given to no one – at this point the admiral – memorialist is wrong), while the Marshal shoulder straps – on 25 May, 1945; and it was also the date when the rank of “Admiral of the Fleet” was equated to the rank of “Marshal of the Soviet Union”. He was disgraced on 3 February, 1948 and restored to his former rank on 11 May, 1953. After Kuznetsov’s next demotion (17 February, 1956), Isakov was considered the sole Marshal of the Fleet. Isakov died on 28 October, 1967 and two weeks after his death this rank was given to Sergey Georgievich Gorshkov, Kuznetsov’s successor for the position of the Navy Commander-in-Chief, who bore this rank up to his death in 1988. Since that day, there was no other Admiral of the Soviet Union Fleet in the Navy. During 1962-1989, the re-established rank of “Admiral of the Fleet” was given many times to the Navy Commander-in-Chiefs (S.G. Gorshkov and his successor V.N. Chernavin), Deputy Commander-in-Chiefs, heads of the Navy Headquarters and some Fleet commanders. Altogether (not counting Kuznetsov, Isakov and Gorshkov), there were 9 military commanders who were granted the rank of “Admiral of the Fleet”. With the collapse of the Soviet Union, the rank of “Admiral of the Soviet Union Fleet” was abolished. In modern Russian Fleet the highest rank is Admiral of the Fleet (which corresponds to the land forces rank of General of the Army). Thus, the highest ranks in the Army and Navy were equated as it had been in 1940-1945. 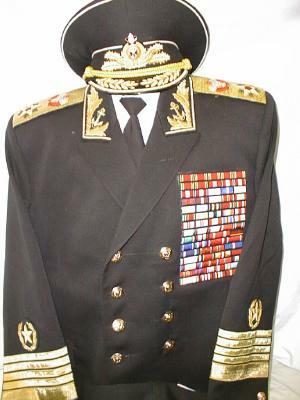 During 1962-1997, the Soviet (and later Russian) Admirals of the Fleet used to wear insignia and badges of rank equal to those of Marshals of the Army. 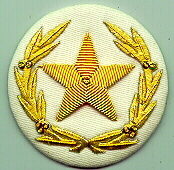 Instead of the four-star shoulder straps, a new form of shoulder straps with one big star was designed; while there was a Marshal Star of a “small” size placed on the tie in full dress (parade uniform). The sole purpose of this change in uniform was to overcome the “inequality” between Admirals of the Fleet and rank-equal Marshals of the Army. 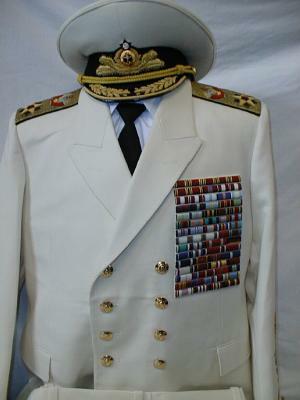 After the abolition of Marshal of the Army rank in 1993, there was no longer need in specific badges of rank and insignia of the Admiral of the Fleet. 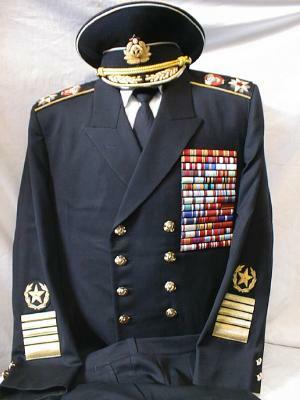 In accordance with the Russian President’s decree of 27 January, 1997, Admirals of the Fleet received back the shoulder straps with four stars in a row which had been introduced in 1943-1944, while the Supreme Soviet Presidium’s decree N 4735-Õ “On the Marshal badge of rank and military insignia “Marshal Star”…” of 15 April,1981 was declared invalid in the territory of the Russian Federation. (1) Prior to “Admiral of the Fleet”, the rank of “Admiral” was given to the following military commanders: L.M. Galler, N.G. Kuznetsov, I.S. Isakov (all since 04.06.1940) and V.F. Tributs and I.S. Yumashev (since 31.05.1943).